Hello my lovies… only a few days to go and we will be celebrating Christmas. The trees are up. The Christmas decoration is already everywhere and the fairy lights simply do their magic. This means a lot of shopping has to be done in order to gift our beloved people. And to enjoy a blessed and beautiful evening, filled with soul-searching and realizations regarding the passed year we have to have the best presents ( just for our own sake ). This is not what Christmas is about at all. But thanks to our consumer instincts we have made it to the finest excuse for spending some dollars. If I have to be honest I do not approve that, but I actually love gifting any time of the year. With all that being said here comes my delayed Christmas Gift Guide. 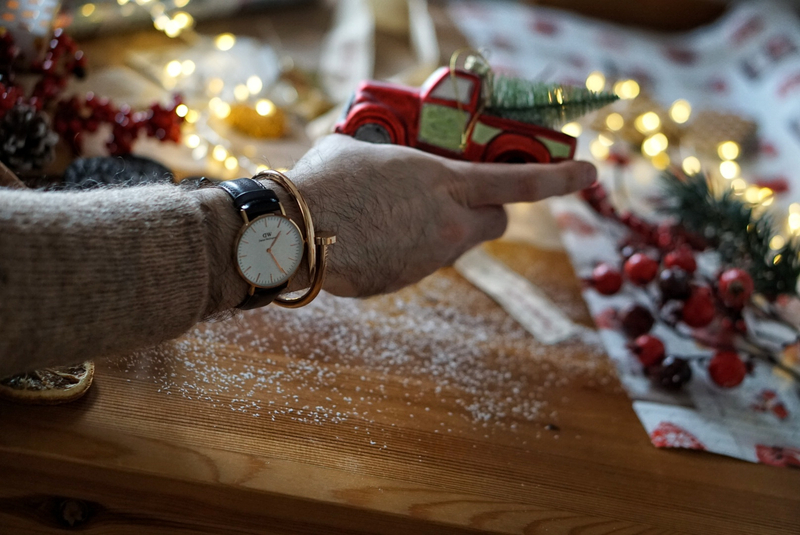 My first pick for this year’s gift guide is a Daniel Wellington watch. It is a classy gift and looks elegant and sophisticated on everyone. Basically one can do nothing wrong with buying that watch. You can also find so many different and new models on their site. Second pick would be a beautiful Christmasy fragrance. My faves at the moment are nothing new actually. 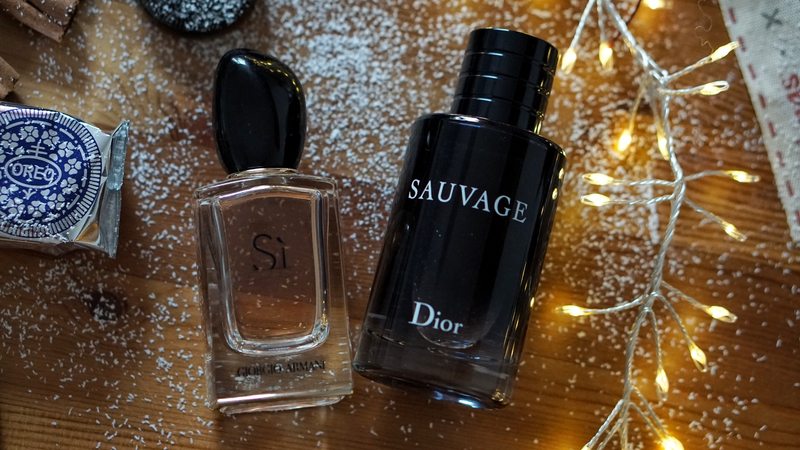 For men…the Dior Sauvage and for women the Armani Si. With a new scent everything looks, feels and smells better. And we all know how powerful scents can get into our brains and can teleport us years back. That is what I adore when it comes to perfumes. We all know that the traces of time can never be completely removed… but there is nothing wrong with cheating a bit. 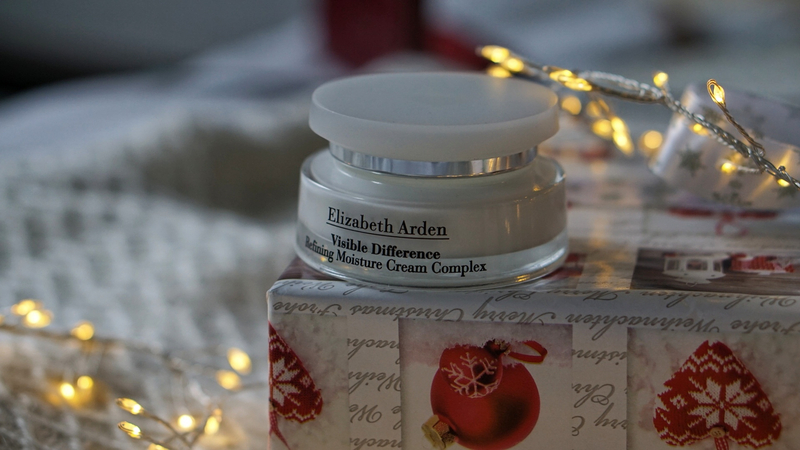 My picks for maybe the best moisturizers are: Elisabeth Arden’s Visible Difference and L’Oreal Hydra Genius. Because the first step of preventing wrinkles is MOISTURIZING. With these two face creams you will be on the top of your game. 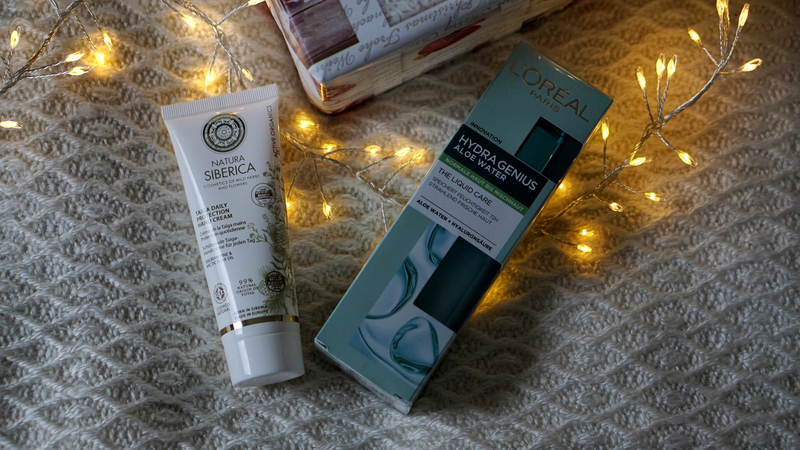 Furthermore that nourishing hand creme from Natura Siberica will leave your hands soft and protected in the winter. Each and every one of us has the type of friends, who are obsessing over make up. 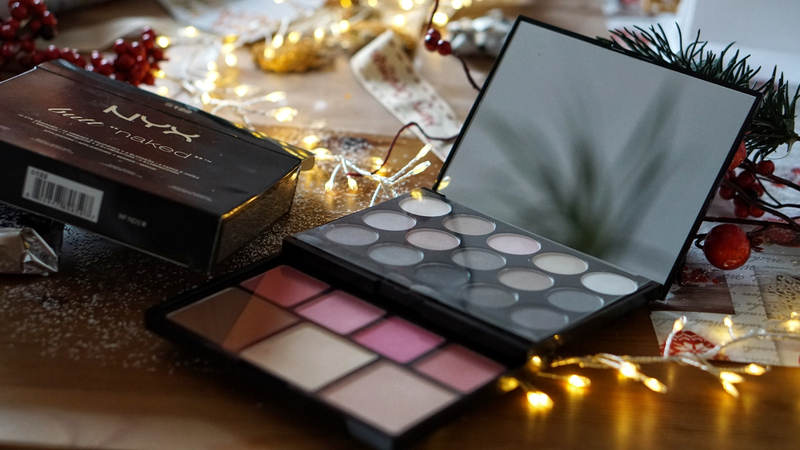 Eye shadows, blushes, highlighter or bronzer…. and there is a palette, which has it all. It is the buttnaked palette from NYX. 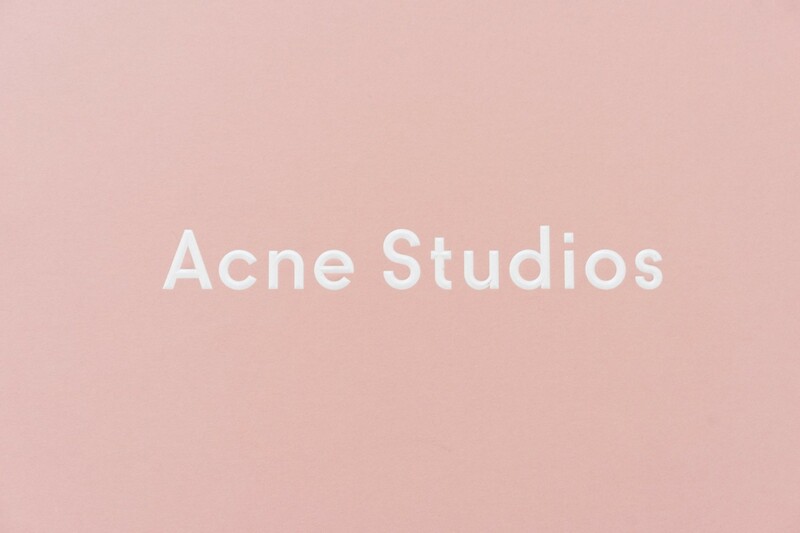 This palette is affordable and the color pay off amazing. 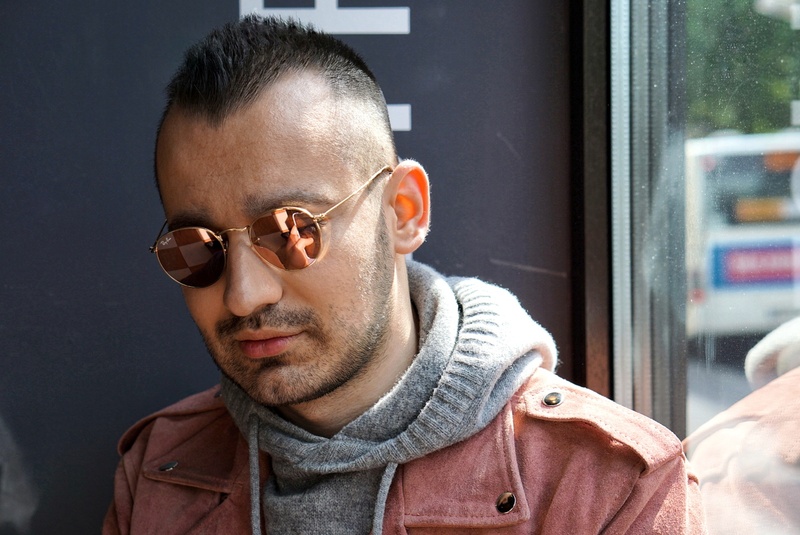 For all fashionistas … it does not go better than a pair of designer sunglasses. My faves at the moment… the RUN AWAY from Fendi. It is a splurge, I won’t lie, but imagine the happy face of the person who receives it. 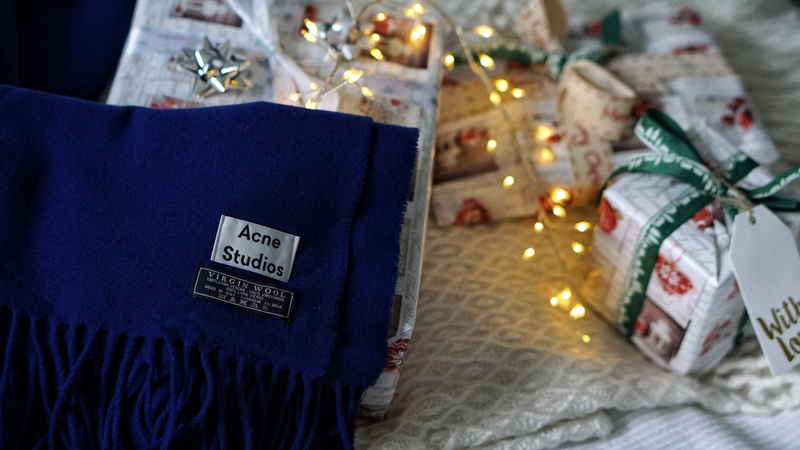 Another Designer gift is the Acne scarf, cause let’s face it: No one does scarfs better than Acne Studios and for that price… and by the way the quality is perfection. 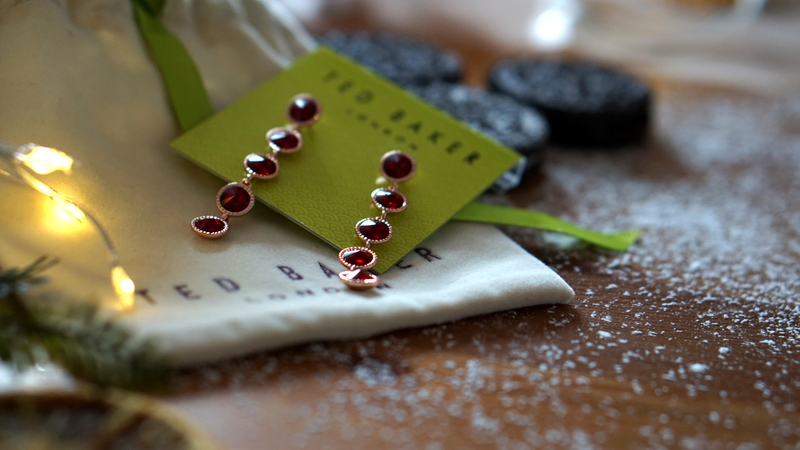 If you want to gift Jewelry… Ted Baker has a great selection. 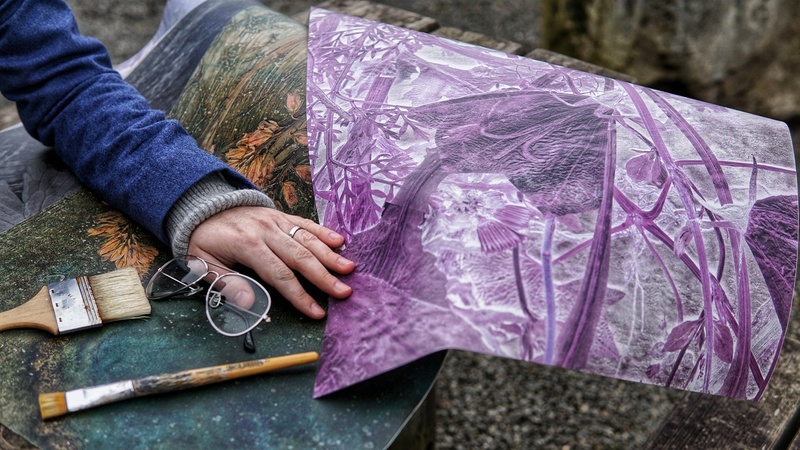 By entering the site you will find yourself transported in another world. 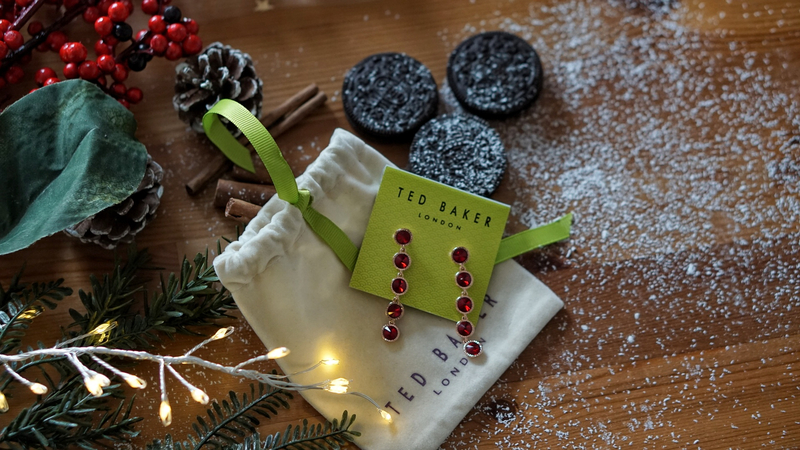 I have chosen these deep ruby red earrings, which are very festive and quite the eye catcher. 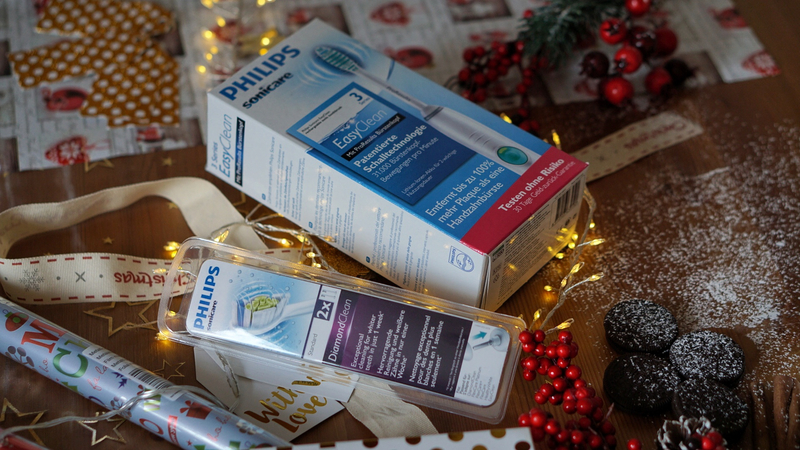 As I was searching for gifts this year, I stumbled across that awesome Tooth brush from Philips. This Sonicare Series 3 gum health tooth brush will make all your teeth dreams come true. 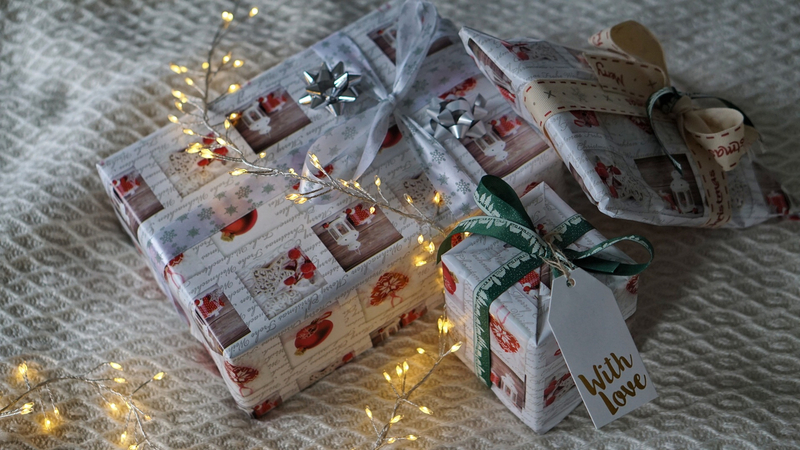 And my lovelies, please do not forget that the wrapping of the presents…. is a very important step. Do not underestimate it. In the end it can probably make or break the whole gifting experience. But the most important thing on Christmas is to think of your loved ones, to carry them in your hearts and thoughts and to never stop loving them. Have a blessed and merry Christmas my lovelies. 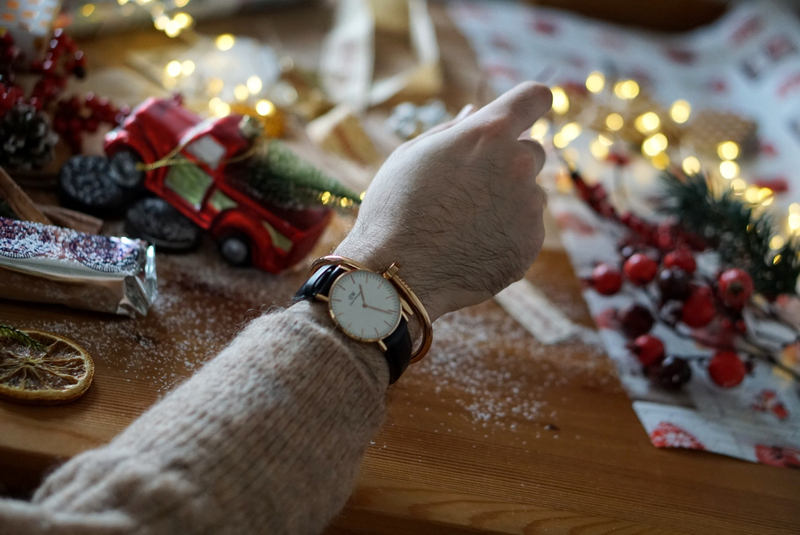 It is almost Christmas, 10 more days to go …. and we have already had snow here in Germany my friends. I have to be honest… it was a fabulous feeling. When the white snowflakes start falling from the sky…. it is the best. And suddenly I feel like 10 again. Sitting in front of the fire, with the big Christmas tree just waiting for my parents to come home and smell their perfumes when getting the most loving hug… I guess you can tell that I love that time of the year. But we all know that with all these feelings and heartwarming lights and the stress of getting all the right gifts… the cold comes. 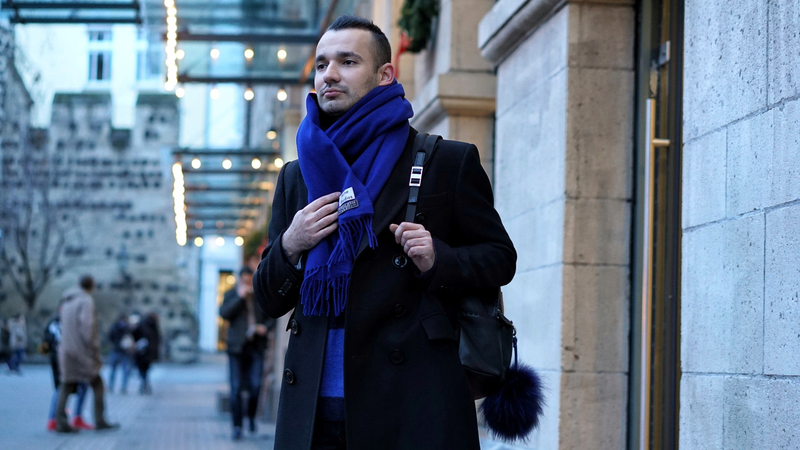 There is one thing that becomes maybe the most important thing, when being out. How to fight the temperatures below 0? 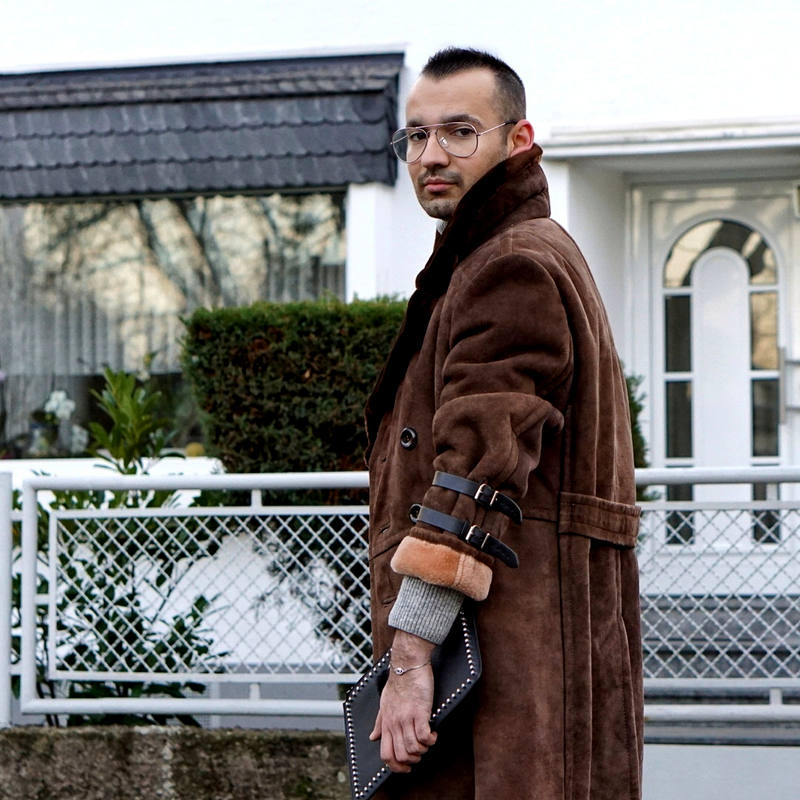 That is my personal shearling time. I get all the thick coats, parkas and shearling coats and jackets out. And trust me… at some point they become a life savior. 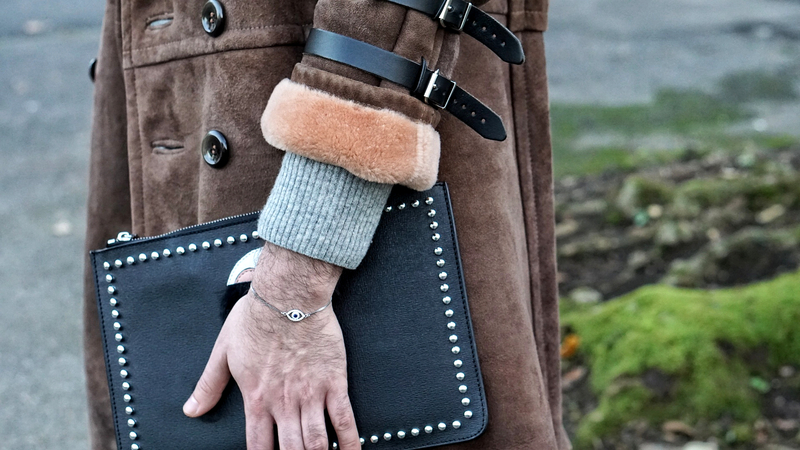 Maybe you will ask… why Shearling? What are the benefits of it? Why not a faux shearling since they are so in right now? The answer is actually simple… It is a natural fiber… it is insulating, it transfers the moisture from your body, it is breathable… It delivers extreme warmth and keeps one toasty and protected. The downside is… that some shearling coats and jackets are really heavy. But to be fair… that depends on the way they were made and the quality of the pieces. 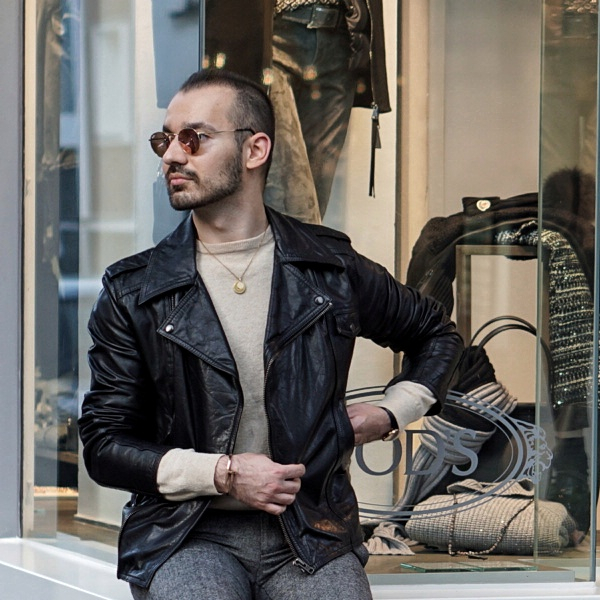 For example if you take a Coach shearling jacket and a vintage Aviator shearling jacket ( RAF )… you would see that the designer one is much lighter. 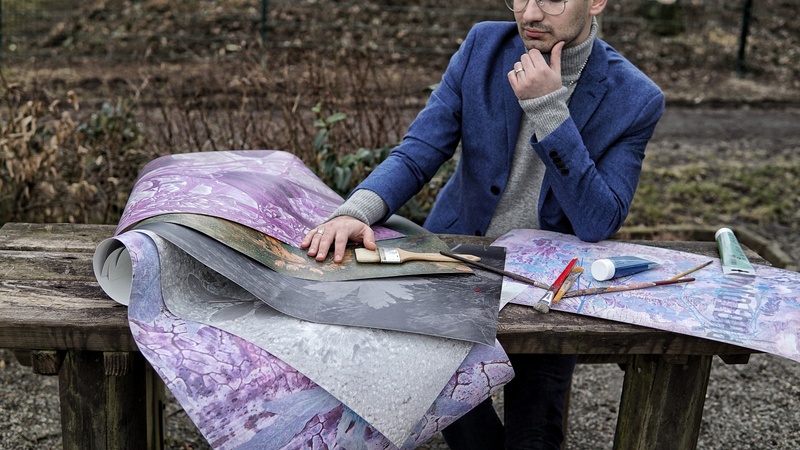 Nowadays the making of such jackets is so much developed and goes through so many steps that it is nearly an art. And since we are a trimmed to always want something that does not complicate things… we need lighter outerwear, which does not restrict us and we can move fluently. The other thing that maybe would stop a lot of you to buy a shearling jacket is the price point. By any means these pieces are not cheap. 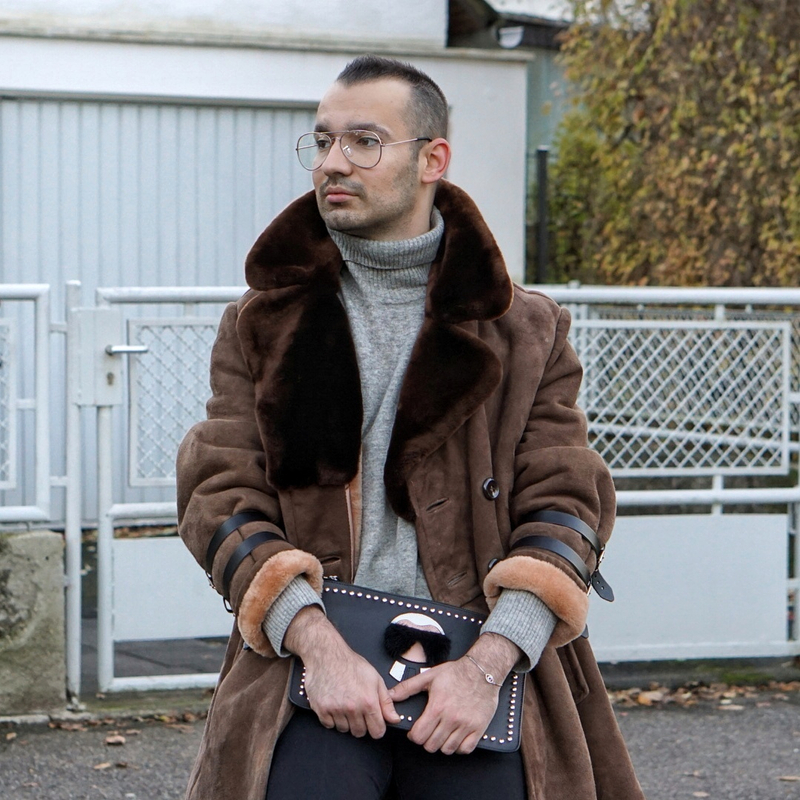 But in comparison with all the faux shearling pieces…. a real shearling will last you for life. And you wont find yourself throwing it away after one season… as you probably would with all the teddy jackets. So instead of buying these faux shearling jackets every year… invest in a real one, you will see and feel the difference for sure. 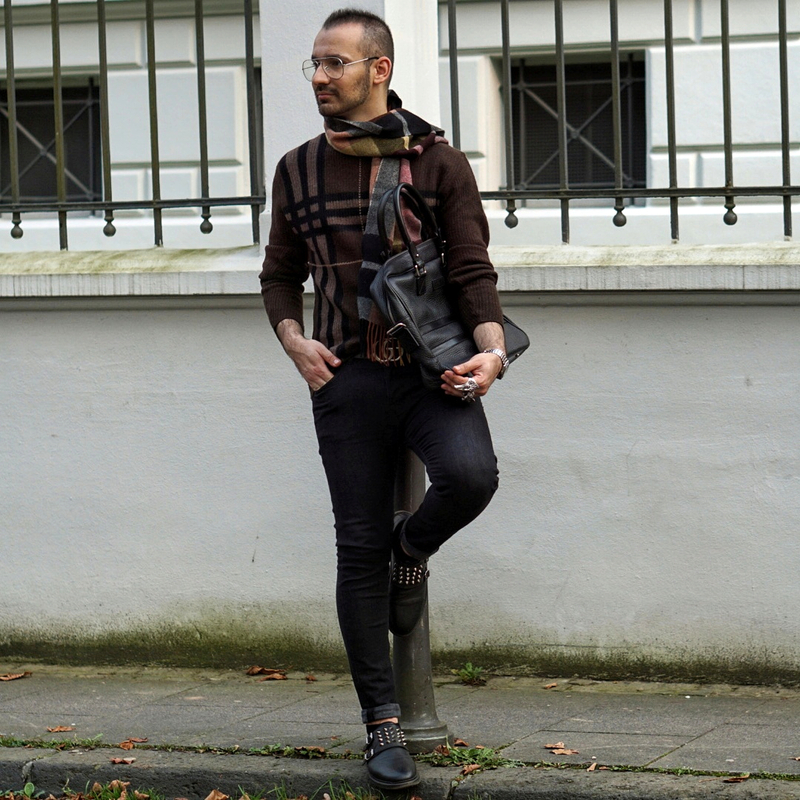 My look for this blogpost is pretty much vintage inspired. The coat I am wearing is a really old one, which was custom made and reinvented in a more modern way with the straps on the sleeves. I personally feel that these details make the coat look more aviator like. It is made out of a thick, but very soft shearling. 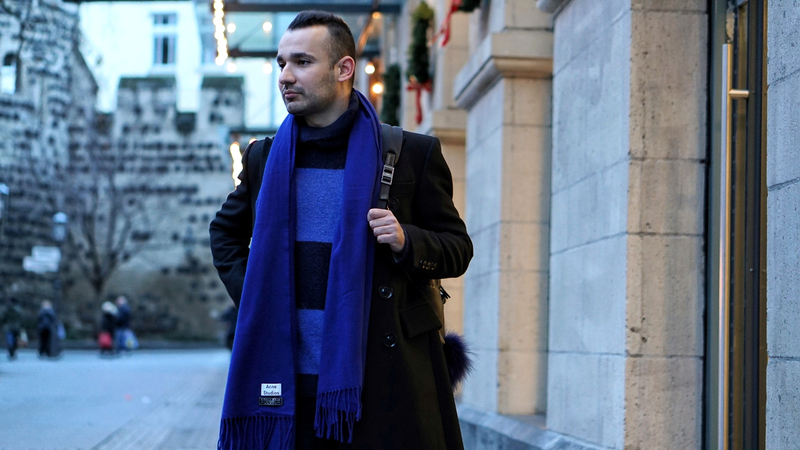 The wide sleeves allow me to move without problems and without feeling like being trapped in my own outerwear. The look underneath is simple, but classy, a wool turtle neck jumper from H&M, simple black fitted jeans by Zara and my studded Converse. The accessories are muted as well… an evil eye bracelet and my Fendi Karlito clutch for the designer feeling of it all. And Voila… the magic is ready. With all that being said, I hope you would agree that winter is for sure the most perfect shearling time. 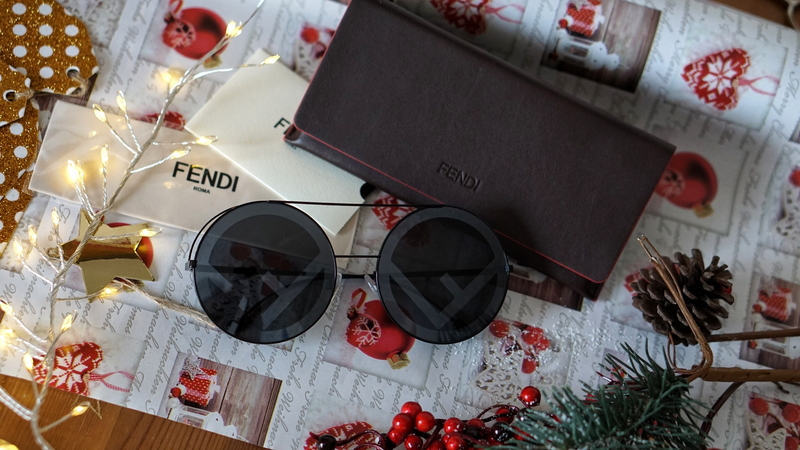 Be safe and hope you would get the most stunning Christmas gifts for your beloved ones. Don’t forget that my Gift guide is coming this Sunday. Hello my lovely people. Wherever you may find yourself, I hope life treats you kindly. It has been a hot second since I posted on my blog. But this does not mean that I have lost my passion for fashion. As it so often happens, life just gets in between. Stuff piles up, tasks and errands drown one and basically I wanted to scream at some point. And we all know what impact that stress has one me…. shopping. There was a piece, that I had been eyeing for a while now, let me tell you. 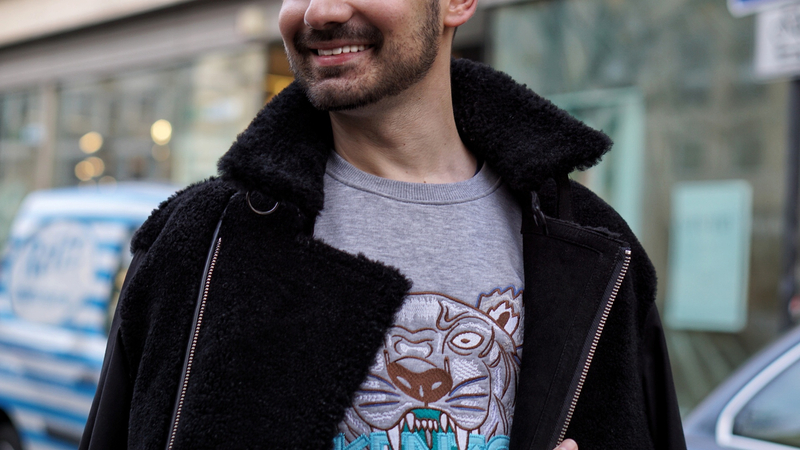 The logical consequence was… yes you have guessed it right… to buy it, as I did.It is a beautiful Kenzo jumper in a really light dove grey color with the brands signature tiger head. The lettering of the brands name is in a vibrant light blue, almost turquoise shade, which pops really beautifully on the grey background. 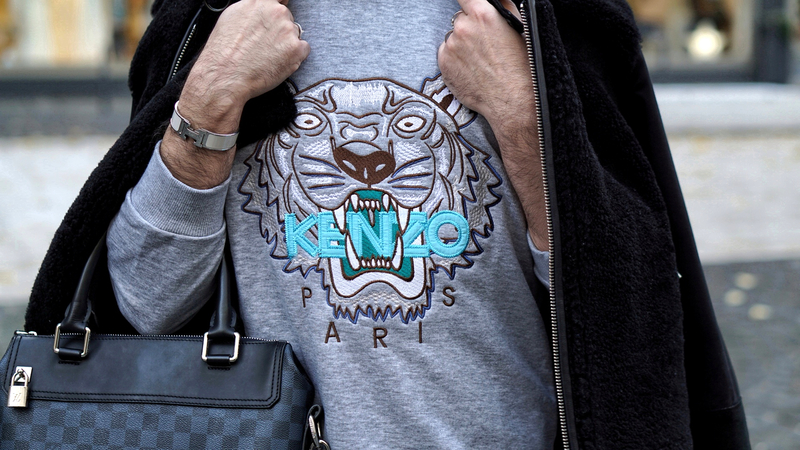 If I have to be honest, I have always admired the Kenzo jumper and the brand in general. Their collaboration with H&M last year is still on my mind due to the bold choices they have made. I do not own a lot of the brand, due to the many many colors and crazy prints they have. 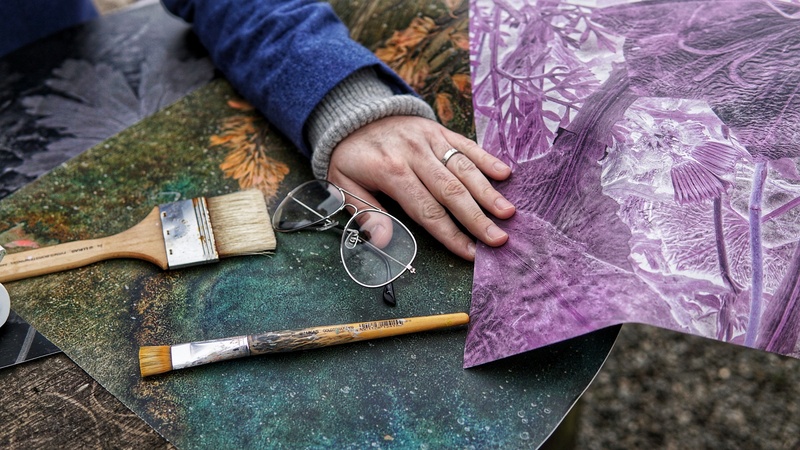 The reason… I consider myself a more muted person, when it comes to colors. Buying that sweater was not an easy choice, since I simply couldn’t decide between a black one and a grey one. At the end the latter made the cut. This particular piece of fashion is beautifully made, the stitching is impeccable, the colors to die for, the signature tiger head is really stylized, the lettering embroidered. The only downside… it is a cotton blend. It is not a wool jumper or a cashmere one, it is simply not going to keep you warm in the winter or on a cold fall evening. My trick… wear thermals underneath. That is also why I just couldn’t pass the opportunity to style the whole look with my beloved ALL SAINTS shearling Talbot jacket, especially since it was freezing on that day. Now if you have been paying attention to the black Friday`s sales, you would have probably noticed, that ALL SAINTS had 30 % on all of their pieces. 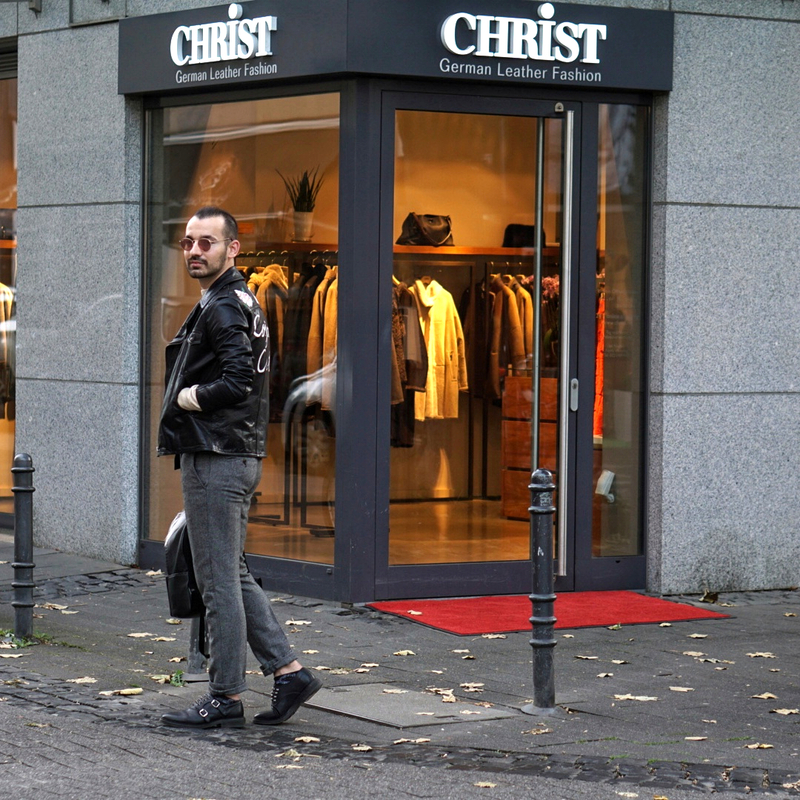 Leather jacket, shearling jackets, jumpers, all were included. 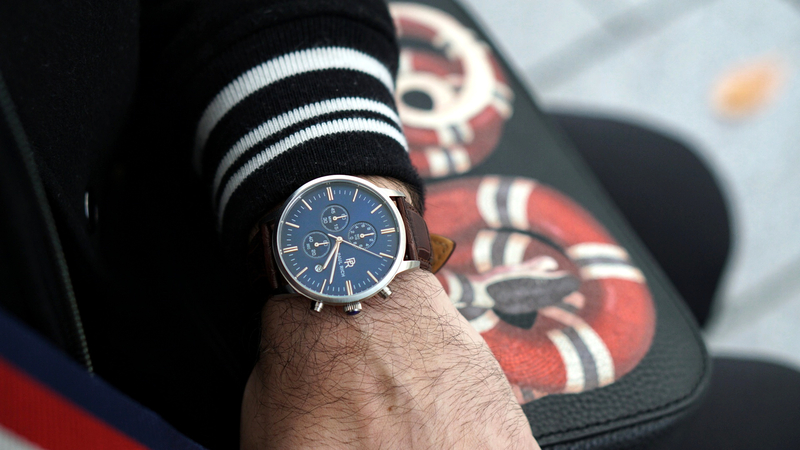 So if you were in need of a good leather outerwear piece… that was the time to score a deal. My jeans are from H&M, because lets face it… their Denim is actually pretty good in my opinion. I don’t fancy the really thick and restricted denim in general, that is why H&M always delivers. 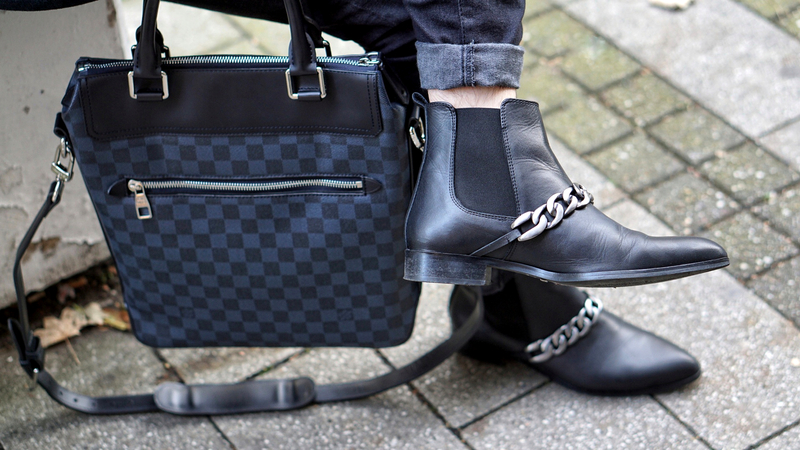 The boots with the thick metal chains are from Buffalo and my Louis Vuitton Greenwich tote completes the whole look. 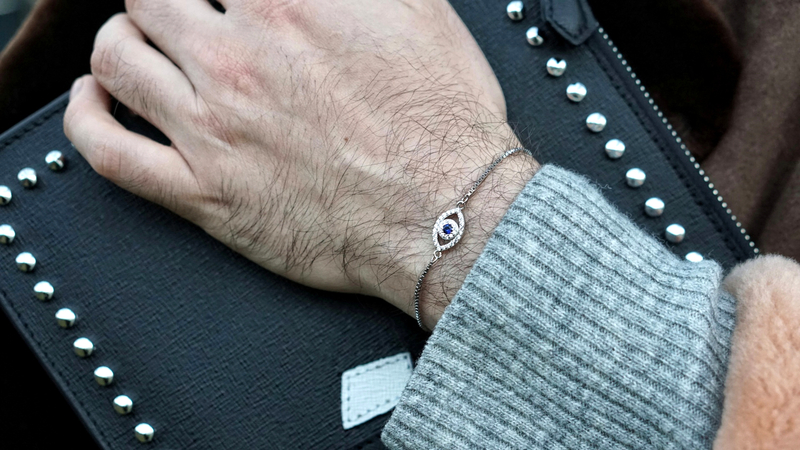 A simple white Hermes clic clac cuff is a perfect accessory for that outfit, without being too loud or taking from the attention on the sweater. With all that being said my darling people…. I hope I could inspire you. Stay safe and beautiful. “A few seasons ago, far far away, in a land where everything seems possible, where croissants taste like heaven and baguettes are a necessity, a trend was born. It was a bag trend. And it had nothing to do with all those big and chunky leather bags, we all know. 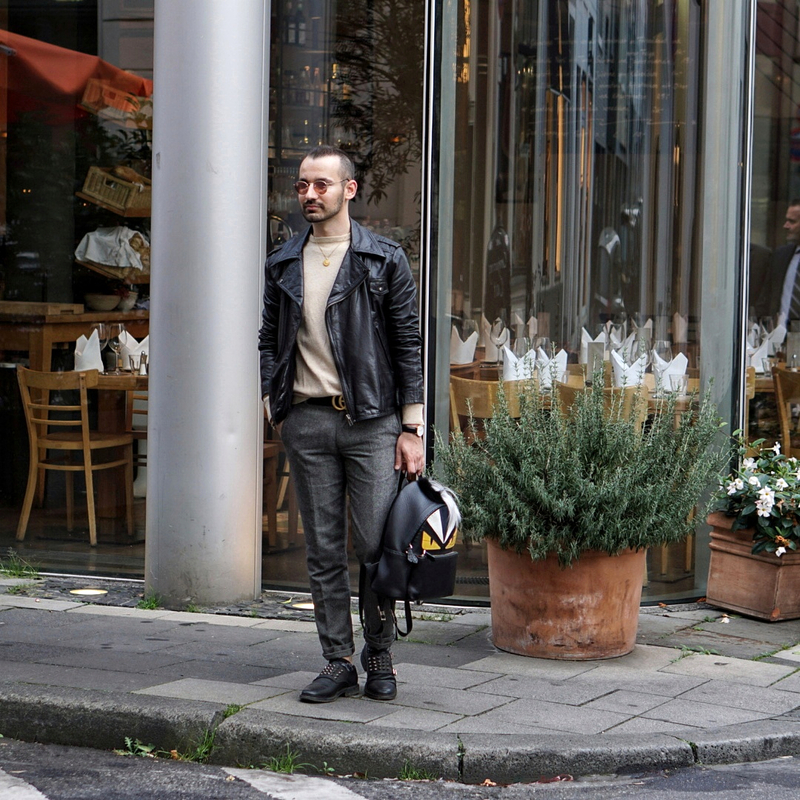 It was the mini bag trend.” As you have already seen it on Fendi, Coach, Celine and even Balenciaga, you know that the mini bags are here to stay. ( I am not so sure about the nano and micro bags tho ). 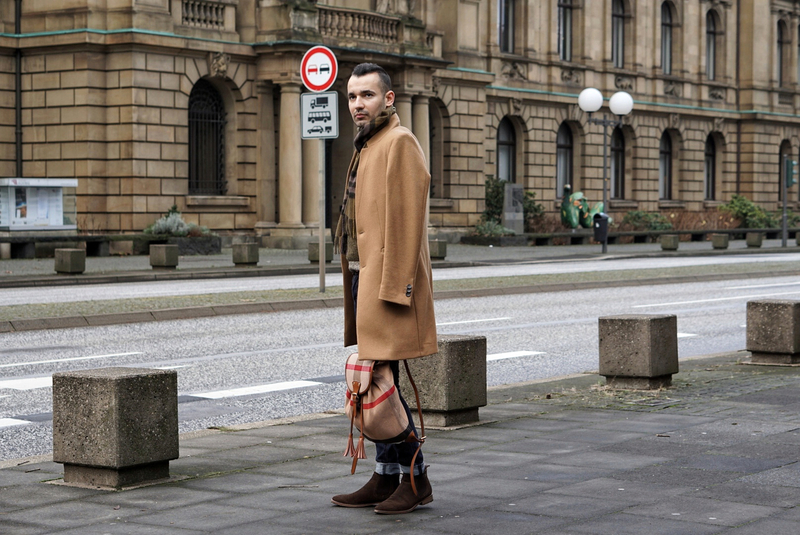 It was a long way till that fashion movement was accepted, embraced and injected into the men’s fashion world. I did fall in love with that accessory newbie from the get-go. I remember seeing the Celine mini for the first time and I was mesmerized. There was something so new about it, at least for me. And since I love anything innovative in fashion, I was hooked there and then. 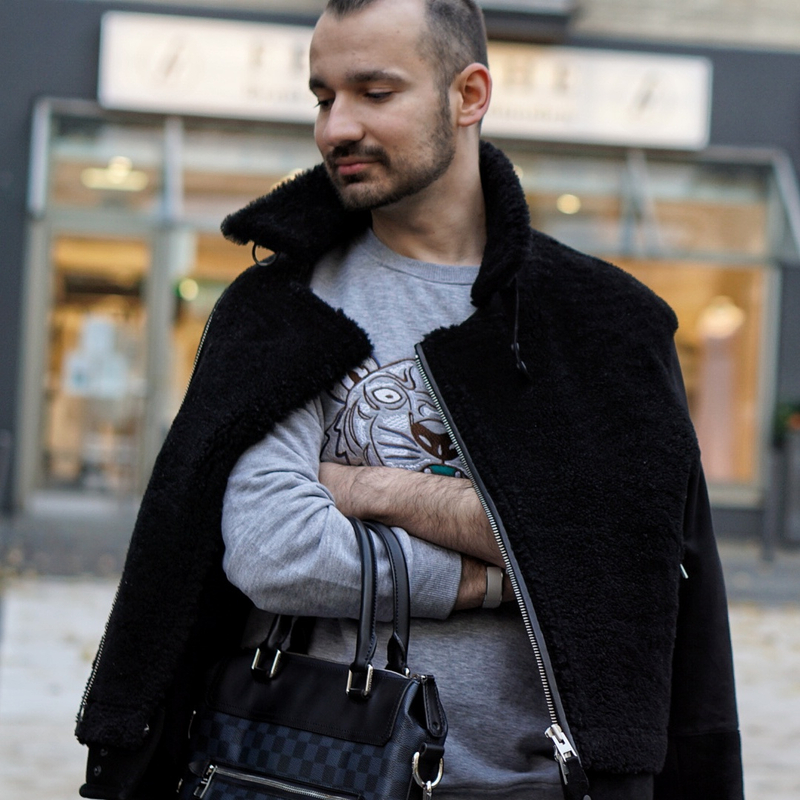 After that I had to wait… because clearly it was a women’s bag trend. But I am never that kind of a person, who sticks to boundaries. This means… I can clearly buy something from the women’s section, if I feel that is more of a unisex piece. Or even if I have an idea of styling that piece in a manly way. Basically styling can make or break your outfit, and you can easily go from the most modern fashionista to the outsider of the party. The other problem that always occurs: the women’s fashion is so much more fun and trendy. It always has the most modern touch and the best embroideries and actually really good and cute ideas. The nearest thing to a cool stylish mini bag in the men’s bags section is maybe a fannypack. But unfortunately they are not really up my alley. That is also the reason why I decided I was not waiting any longer. Especially since I was eyeing a Gucci mini bag already. And I mean for a while. Also the idea of being a part of the mini bag trend and squad was really appealing. Who cares that it is a woman’s bag. I know I don’t. My ootd is actually a pretty simple one. 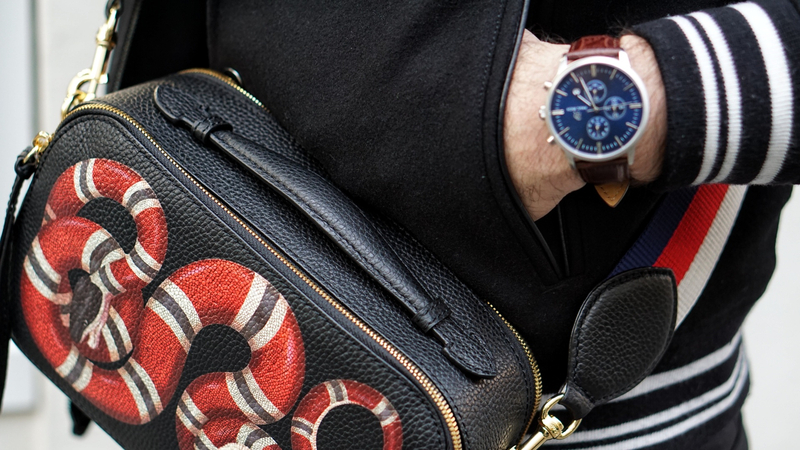 I wanted the focus to be on the Kingsnake and also the bright colors of the bag strap. That is why I opted for all black look. 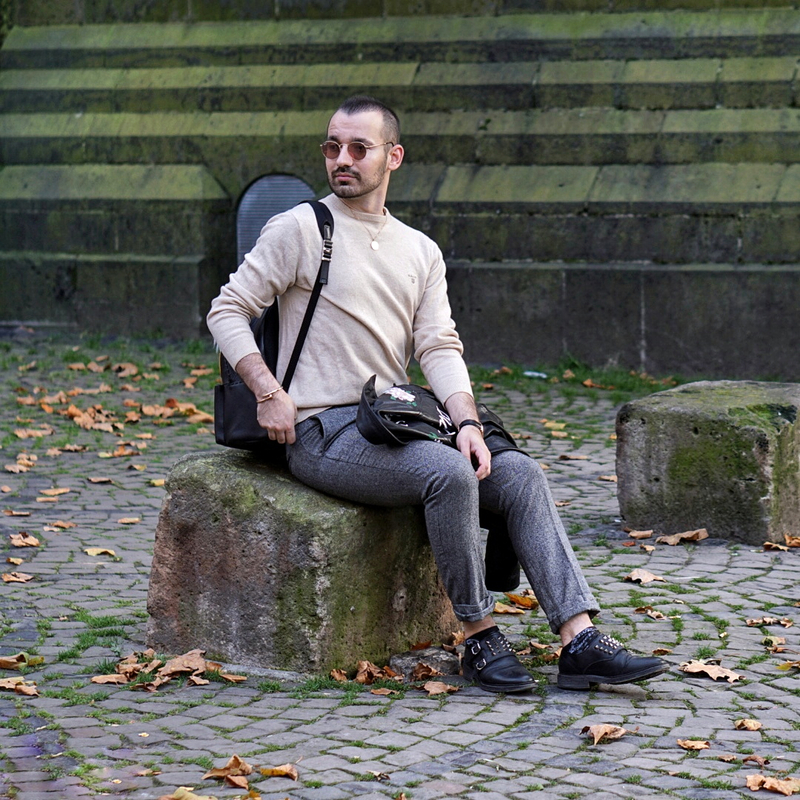 The turtle neck jumper from McNeal was a perfect companion, framing the face and giving a more fall vibe. But also keeping you warm, due to the cashmere blend. The wool pants are from Zara with a straight classic cut leg. 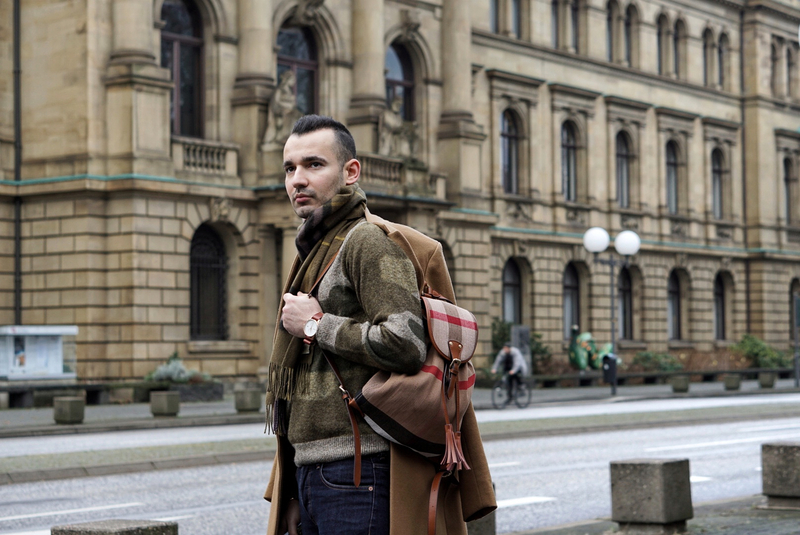 The wool baseball jacket makes the whole outfit more sportive, without taking too much from the attention on the bag. It connects the pieces together, giving a few fun details on the sleeves and neck ares. My Topshot glasses complete the whole ensemble. For accessories I have chosen the Paul Rich watch. 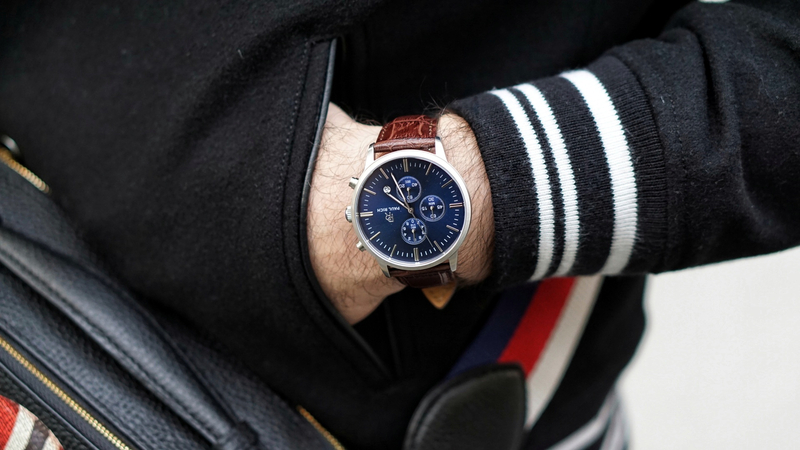 It is a new one in my collection and the brown reddish alligator strap and blue timepiece face correspond amazing with the colors of the Kingsnake mini bag. It did not take long shooting that look and after that I had a beautiful shopping day with my photographer friend, who also has a shopping addiction. I hope you could draw a bit of inspiration and have a great new week. Stay safe and be loved my darling people. And … fashionable. Hello my darling people. How are you doing and how was your Halloween and Thanksgiving? I hope you had a splendid time with your loved ones. And speaking of things we love, I come at you with another fashion related post. It is regarding of curse my fall wardrobe. One of my most worn pieces during the fall season has to be my personalized leather jacket. It is for sure an old one. But like the most leather jackets, it has kept its form and is practically in a perfect condition. Since I have a few of these babies in my closet, I decided to risk it and to try and personalizing that piece. As most of you know I have a bit of a background in drawing, so this project did not scare me at all. 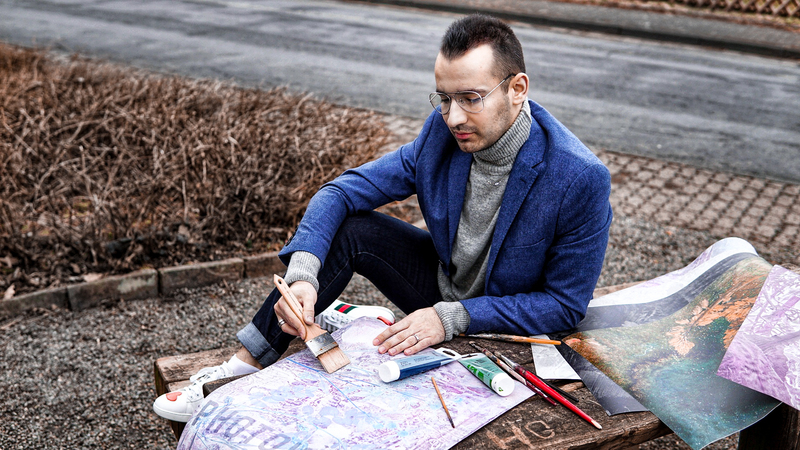 Even if you are lacking the perfect drawing abilities, you can customize your jacket.All you need is an acrylic paint and a brush. I have to confess that I have seen a few videos of people doing that customization on the gram. So my fondness of the idea grew bigger. So big that one day I took that jacket out and started painting. I had no idea what will come out at the end. Or even what I was going to draw. It took no more than 30 minutes. And I was pretty happy with the end result. The flowers on the shoulders came pretty natural to life, since I really love floral motives and florals were really in for the past few seasons. The lettering was kind of an homage to my fashion blog. I preferred the distressed and not so perfect writing, that is why i peeled the paint off on a few places. 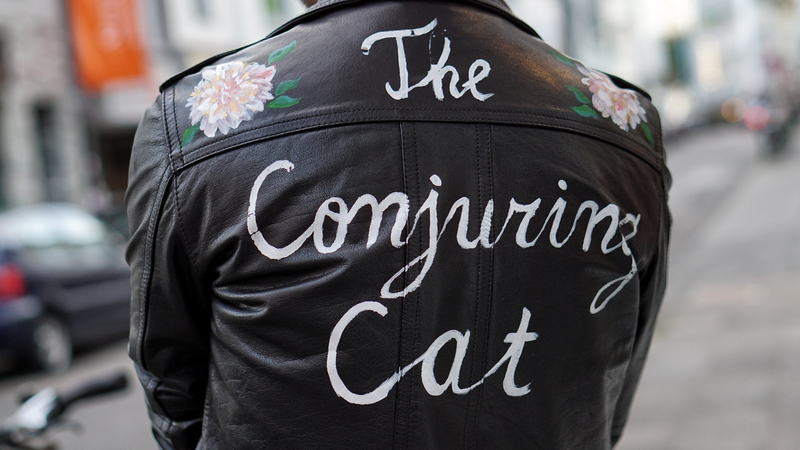 And there it was: my very own personalized leather jacket. The central piece of that look is the leather jacket. I wanted to create an edgy look, but with elements of elegance. 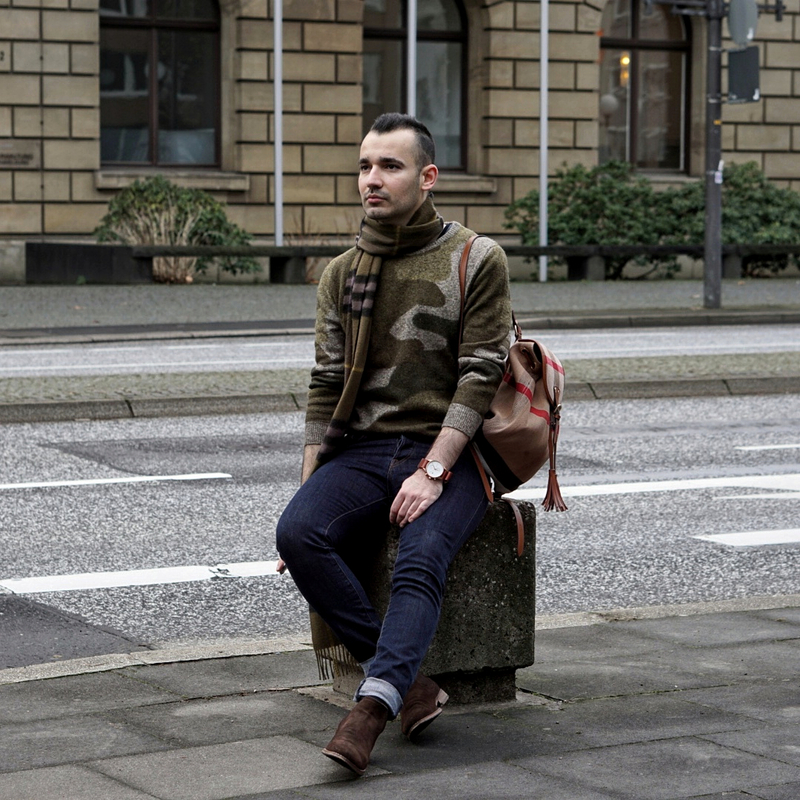 That is also why I have chosen a classic wool Gant jumper with a classic slim fit wool trousers (H&M). To achieve the edginess I have put all my efforts in the accessories. The studded double monks you already know from my previous blog post. 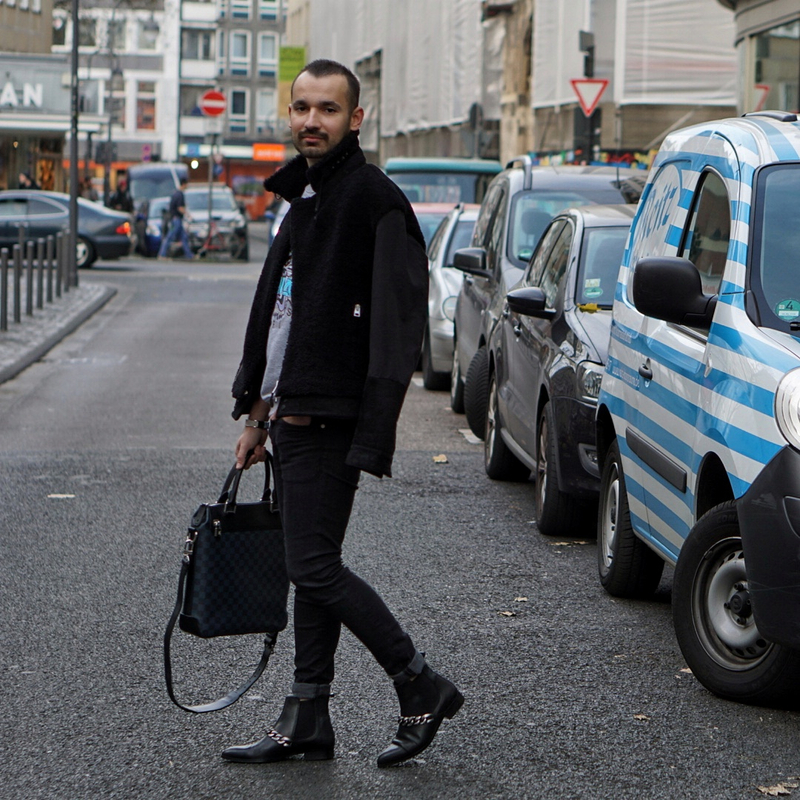 The Fendi Monster backpack was a perfect addition to the whole ensemble. Gold jewelry and watch and also gold Rayban shades make the look complete. Hello my darlings…. it is almost Halloween and the night for tricks or treats is basically upon us. With that we are in the middle of Autumn. And you all know what this means. Colors are literally everywhere… trees… ground… streets. In addition to that the weather is simply marvelous. Warm in the day, but getting a bit chilly after half past 7. Warm jumpers are simply a necessity at this point of the year. But it is still not the time for the thick coats to come to play. Every Fall new trends emerge and have a huge impact on our wardrobe and sense of style.The Fall edition of GQ Style helps us, men, to see what is new in menswear autumn 2017. Today I would like to present a trend, which is near and dear to my heart: the Check. As most of you would already know, I am a Burberry fanatic and with that comes a tremendous love for the British menswear. 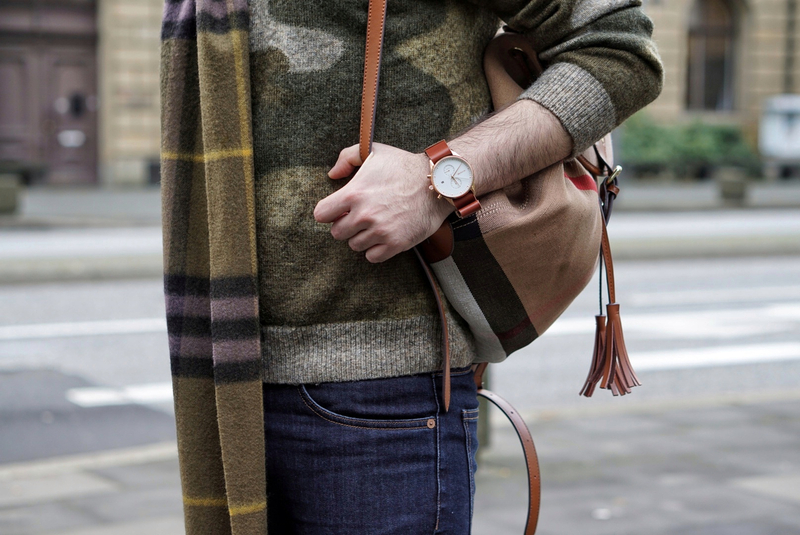 And to be honest… British fashion and Check come hand in hand. This year Burberry and Stella McCartney did not disappoint, for usual. If you were to ask me: Which Designer nails Autumn looks in terms of trends, craftsmanship, luxurious fabrics and impeccable taste level? There is no doubt what my answer would be: Burberry! My look for the day is British inspired, for sure. 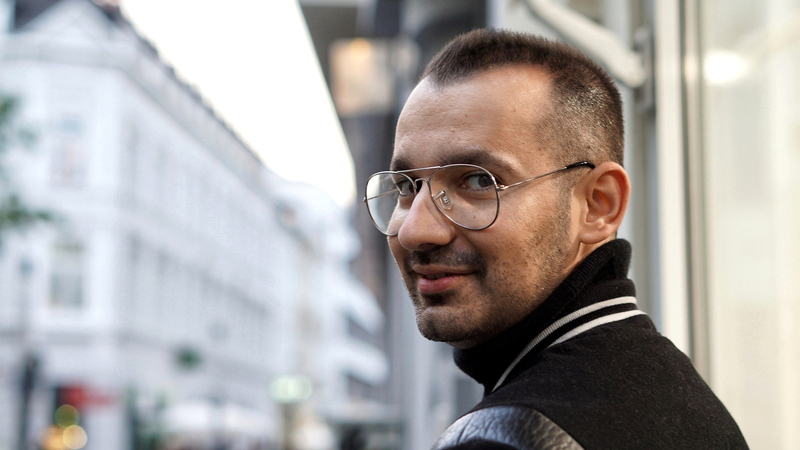 There is something about that trend, which transports me to London in the 80´s and 90´s. 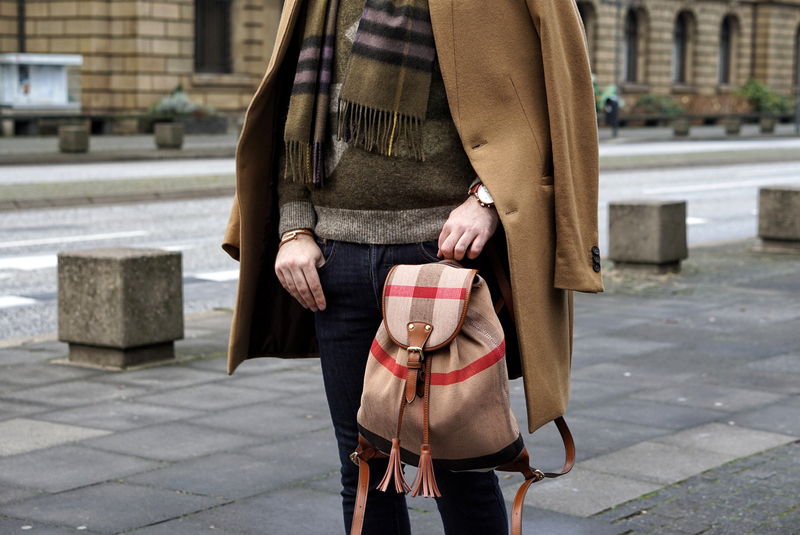 I have chosen a brown checked Burberry jumper as the main piece for the outfit. 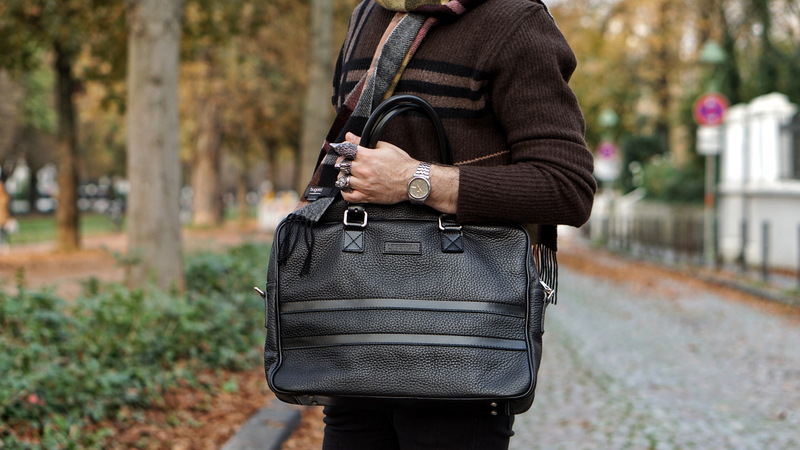 It is from their London line and is made out of a brushed wool and cashmere mix. In terms of pilling, let me reassure you… the Designer jumpers do not have that problem as the High Street pieces. It is soft and keeps you warm. Also you do not need a jacket with that jumper. 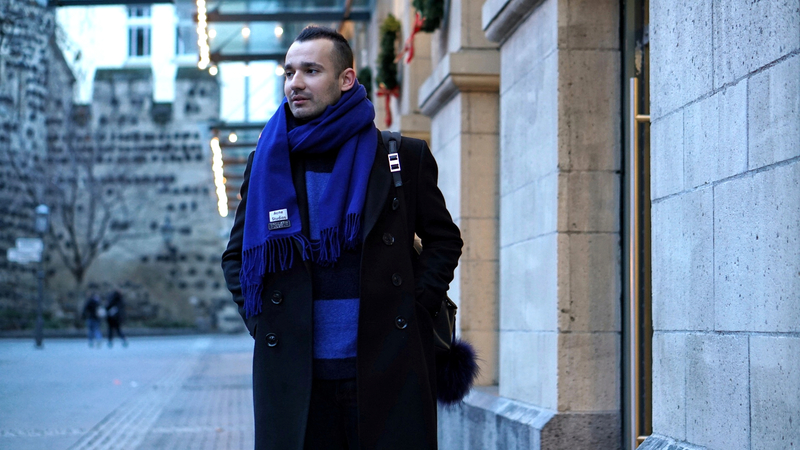 The scarf is from Bugatti. It is 100 % wool and is a bit scratchy. Due to the wool though it is an excellent source of warmth. And since I do not have sensitive skin… the scratchiness is not a problem for me. My jeans are simple skinny H&M jeans. Cotton and stretch. What else can a boy want? 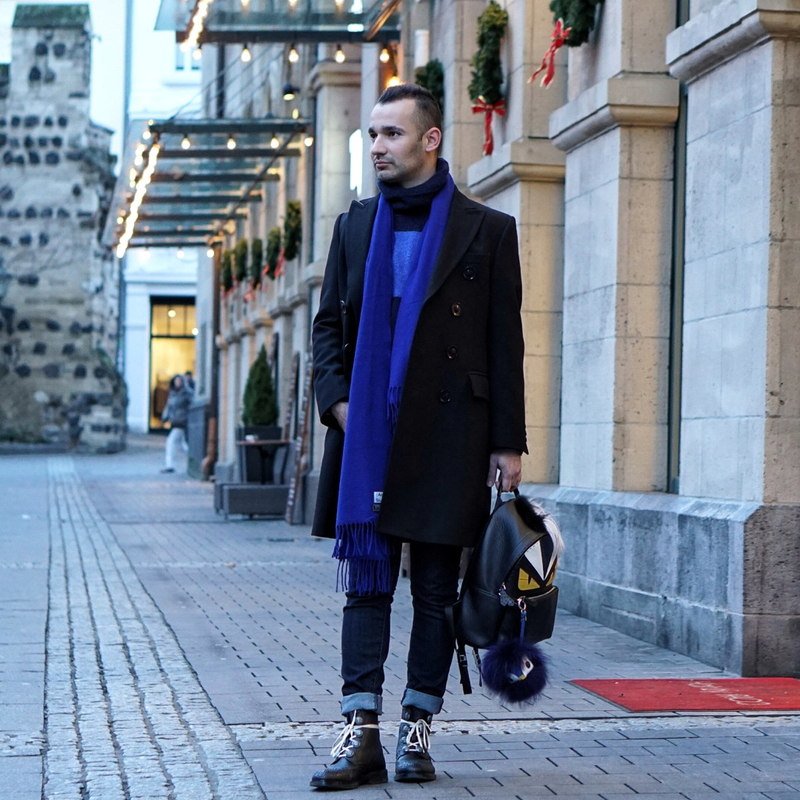 I have chosen a pair of Zara double monk straps to complement the look. Since I needed a bit of a punk moment I have chosen these studded ones. Unfortunately they are from an older collection, but you can find similar ones. 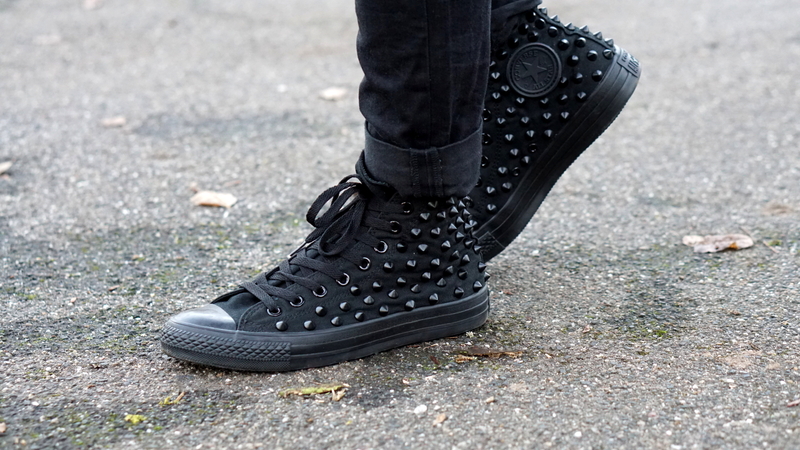 Studs are never out of trend. In addition I have chosen my Karl Lagerfeld leather handle bag, which I bought from TK-maxx. Sometimes there are really great bargains in there. Gucci Marmont belt and custom made rings make the whole look complete. 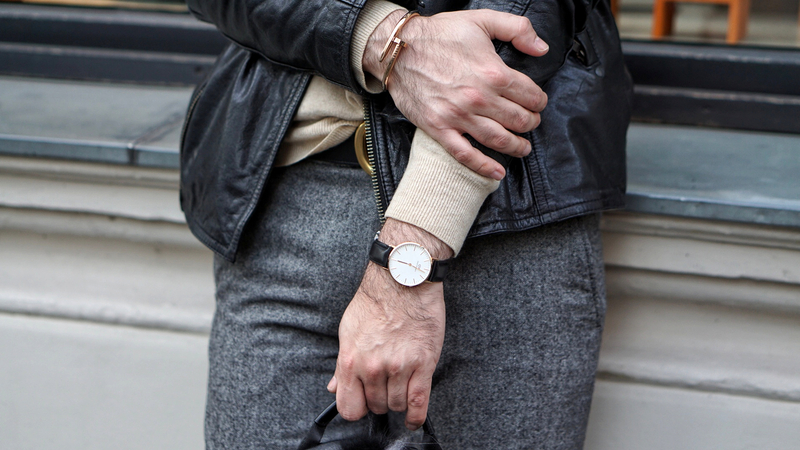 Furthermore my Topman shades, custom made biker rings and Seiko 5 watch complete the whole look. I hope you enjoyed my menswear autumn 2017 take and were able to draw a bit of an inspiration. Hello my lovely people. I am coming at you again with some fall fashion. 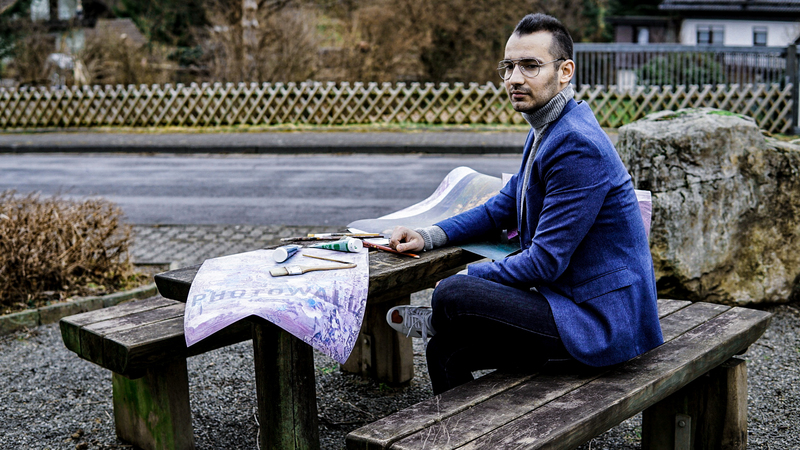 As everybody knows, the fashion designer are the ones who set the fashion trends for the different seasons. Most crucial and important is the New York’s Fashion Week, also London Fashion Week. But who spots these trends? Who makes a list of the colors, which will be In for the upcoming season? The answer is: Pantone Color Institute. They are always present during the FWs. By attending the countless fashion shows they are able to spot and highlight the top 10 colors for men’s and women’s fashion for the upcoming seasons. 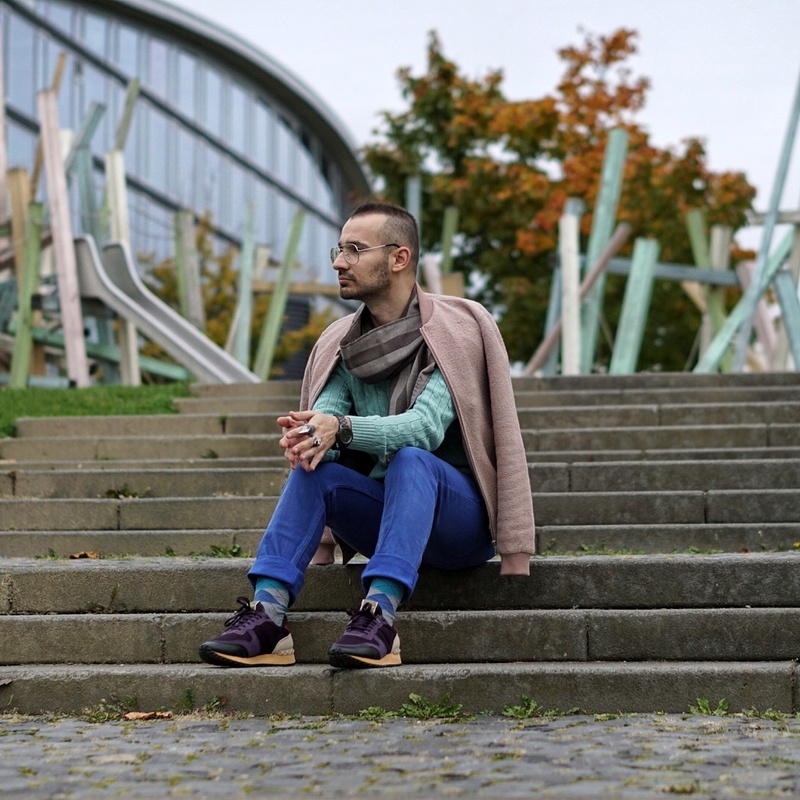 After that report one thing is for sure: wearing colors for autumn is a must. With that come the personal preferences, likes and dislikes regarding shades. And I have to say: Thank God! No one wants to wear the same exact color palette as the guy next to you. Today’s look is inspired by the shades Toast and Navy Peony. As I was looking through my wardrobe the other day I noticed a few fashion pieces I have completely forgotten about. As a matter of fact these Jeans from the Matthew Williamson collection for H&M were my favorite at some point back then. But since I put a few pounds on, there was a bit of a tight situation going on. I put them on just for the fun of it. Never in a million years would I have thought they would fit me. And the miracle happened. Now do not get me started on how happy I was at that particular moment. 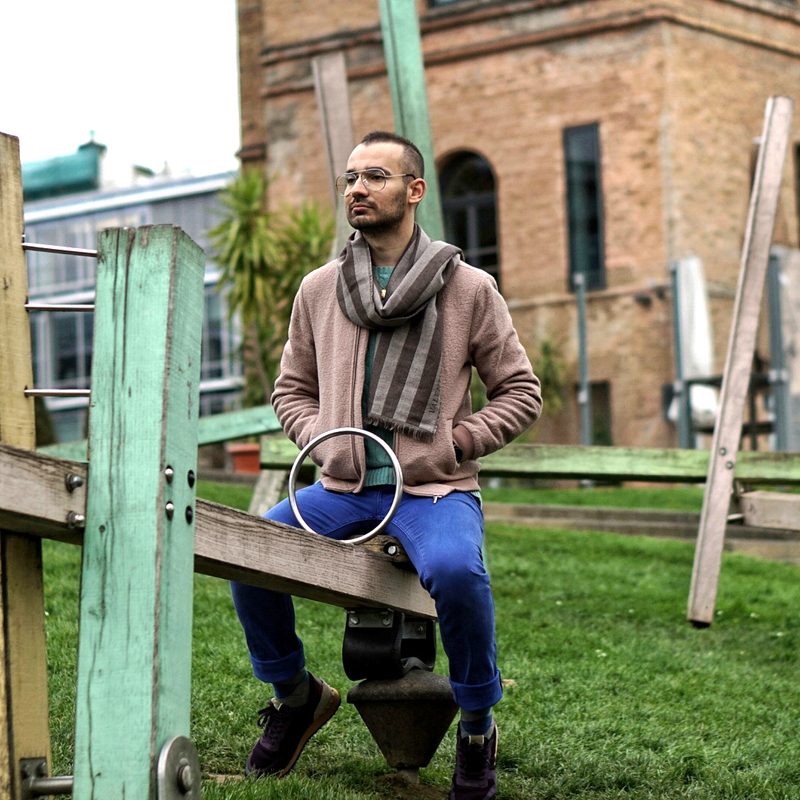 My beloved Topman wool jacket was perfect to add a bit of grounding color and to tune the whole outfit down. 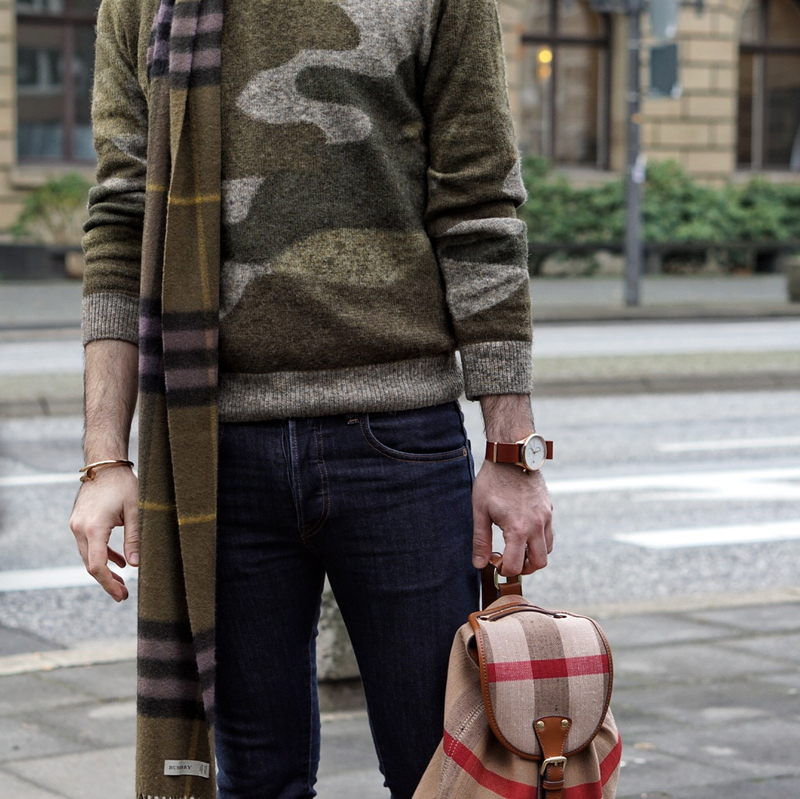 A simple wool and silk cable knit jumper from Ralph Lauren and Valentino scarf and kicks. 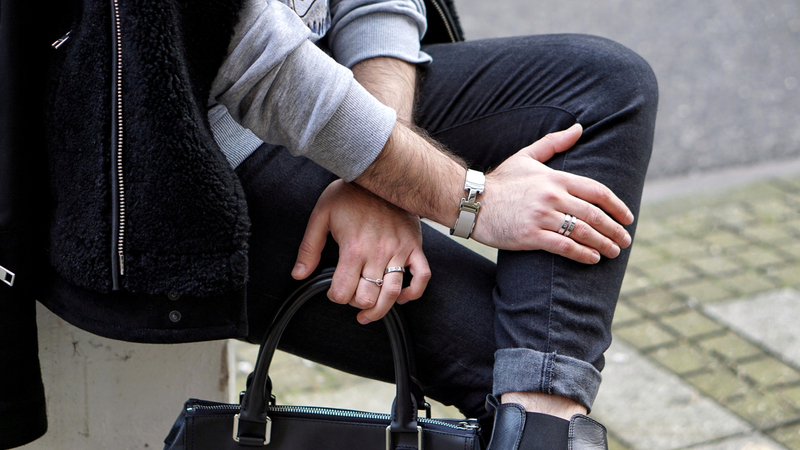 My rings are custom and give the whole look a bit of a biker or maybe even whimsical vibe. After the photo-shoot I went to a local place with a bunch of my friends. We talked about past funny moments, drank a few Gin Tonics and had a spectacular time. In conclusion: wearing colors for autumn is simply a necessity, if you want to shine and impress during that anyway so colorful and beautiful season.